Andy Pierce: All comments are welcome. I have white here in this clash of IGS 5k's. I played at SanSan in order to get sente back from black. This I think is a mistake. Black's NiRenSei means he wants influence, and white's 3-3 hands him even more. Black's approach move seems wrong in this context; it should be at a if black wants to approach here, in line with black's influence-based strategy. SanRenSei looks pretty good for black here too. Alex: I don't know what you mean by getting sente back from Black by playing san-san. 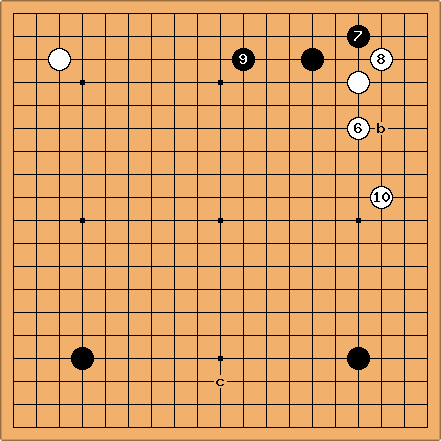 The idea of san-san is that it disposes of the corner in one move, so neither player has much interest in playing near there early on. That would seem to leave the sente situation unchanged, no? When I think about getting sente in the early fuseki, my usual strategy is to play a komoku, takamoku or mokuhazushi in such a way that the opponent wants/needs to approach, but that I can defer answering the approach and start something in another corner. Bill: does seem misplaced, uncoordinated with his other stones. An approach at b is usual, I think. Having given up influence for sente with the 3-3 play, I now, in greed for territory, give up sente with the above joseki (instead of playing at b for example). This going-against-my-own-strategy is a problem I have over-the-board, where it is easy to focus on little things and lose sight of the big picture. I am happy, however, that so far black's direction seems wrong. Alex: Choosing one hoshi and one san-san is rather strange, kind of a mixed message. Having played those two moves, though, I can't say that is any worse than b. It seems to me that b would be too low. Black's approach was certainly from the wrong direction, and should probably be one line further down. Bob McGuigan: I don't think the opening four moves are particularly strange. A GoBase search shows many professional games starting this way, with white winning a fair share of the games. There is a rationale for white's approach. The hoshi move emphasizes influence while the san-san move emphasizes territory so it's a balanced approach. Bill: Taking sente with Wb to play the wedge at c is a good plan. Black seals white in the corner. I think here should be at c instead (or another third line push-from-behind followed by a one-space jump) since the top is uninteresting due to black's strong, low stones. 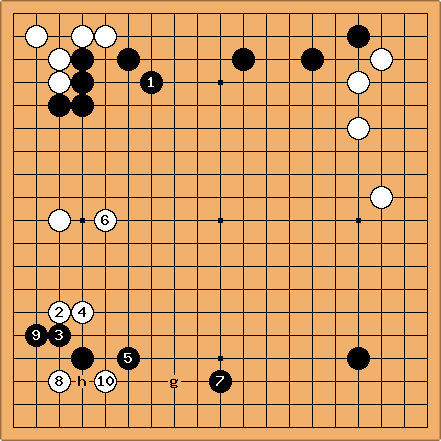 seems like AjiKeshi to me, and I played for life in the corner, but I think this was a wasted move and something like at d (is e possible, or too weak?) would be better. 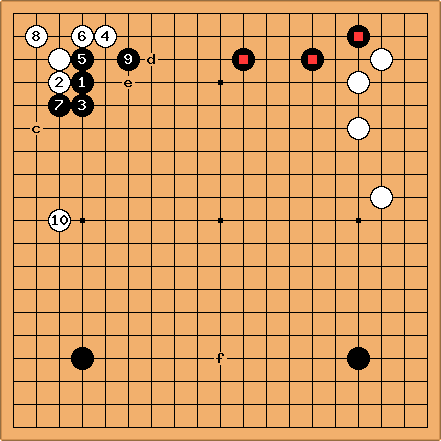 Unfortunately, even with at d now white's direction is wrong, again approaching strong stones. Black takes advantage of in the game to play , sealing white in on both sides. I then played thinking to attack black on the top, but I don't think black is in any danger. I am so far behind in influence now that I think should be at f. If the black stones , are strong (as I think they are), then is again incorrectly approaching strong stones. Alex: is by far the worst move of this fuseki. You were already pretty safe, and if you wanted to be certain of life, expanding your base with e.g. d is always going to be better than making two eyes locally. You say you were worried about d being the wrong direction, but is "minus one point in gote" ever the right direction? is of questionable value, even though it seals White in, and should probably be on the left side. on the left side is probably the right direction, but I might have played it one line closer to the lower left since, as you say, you are playing too close to a strong group. Bill: is misplaced. The top is now non-urgent. 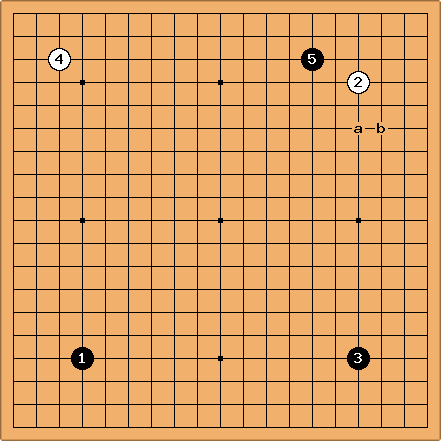 Better sanrensei or approach White's 3-3 from the left side. Bill: is better. If now , develops in the right direction. here seems poor shape and overconcentrated. Black should move elsewhere on the board and leave white to crawl on the top. here seems to lack fighting spirit as this puts no pressure on black. Maybe white should try the double approach at g instead? After , white invades at and lives with , at the expense of security and territory on the left side. 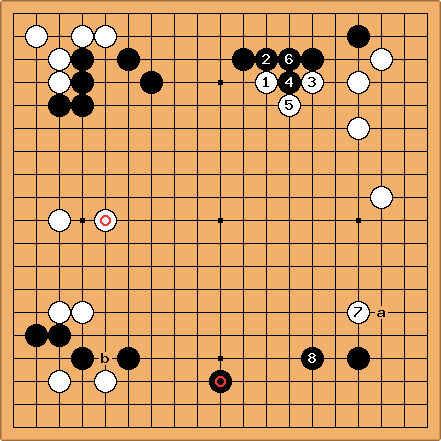 A series of 5 kyu errors and lack of vision on both sides leads eventually to the game being decided by 0.5 point. Alex: The problem with this idea is that, whether is here or at a, is still a good response, because it makes a double-purpose move. On the plus side, is shining. In any case, a move around or a seems almost inevitable, unless White is planning on letting Black play in this corner first; it is unlikely that approaching from the closed side will ever be a good idea, with the lower left stones in such a precarious position. Also, is it just me or is W b really threatening for Black, giving him a small corner back in return for White getting lots of thickness outside? Anyway, it seems like you correctly identified most of your own mistakes in the fuseki, as well as those of your opponent. I suppose the obvious question, then, is why don't you think of these things during the game? I suspect the answer is that you play too quickly, because that's when I usually make moves that I know to be wrong the moment I see them on the screen/board. Bill: in the previous game diagram is horrid. The approach at g, as suggested, is much better. And is just silly. If Black replies at h, now what? White has strengthened Black for peanuts. is ridiculous. What is Black going to attack? Also, Alex, I find your diagram confusing. You seem to be giving White two moves in a row. Alex: Oops, you're right. For some reason, I thought it was White's move. I think I should either stop checking Sensei's first thing in the morning (addicted much?) or at least refrain from responding to anything until I'm fully awake. Perhaps I'll just suggest the sequence from to instead of in the previous diagram. Although perhaps g is better, as you suggest.